Increase airflow and performance by installing a Do88 Turbo Intake. IR-120-MK is designed to work with 2010+ Volvo 3.0L T6 Engines. Do88 Turbo Intake for 3.0L T6 Engines has better air flow when compared to the stock intake pipe. This was verified by testing on a SuperFlow SF-1020 flow bench. The do88 Turbo Intake Pipe is 76mm (3 inch), outer diameter, all the way to eliminate all restrictions. 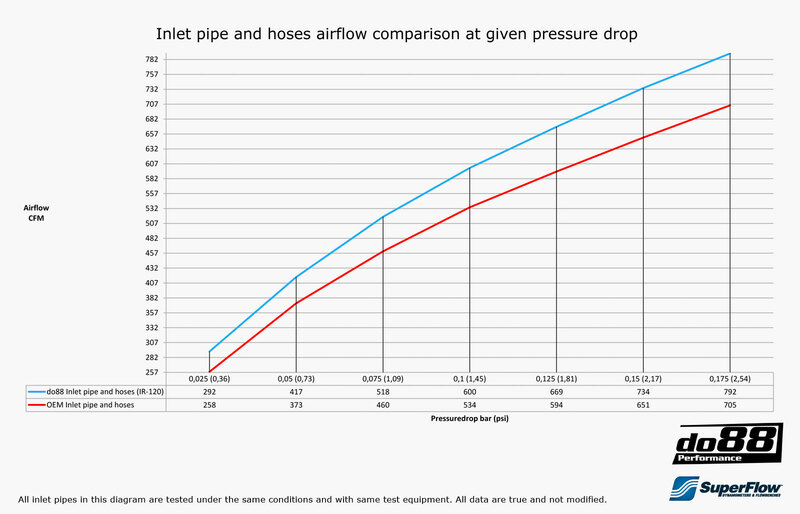 The Do88 turbo Intake Pipe has an air flow at 0,125bar/1,81psi pressure drop 669CFM, compared to the stock pipe that has 594CFM. The turbo inlet pipe is manufactured in 3” mandrel bent seamless aluminium pipe. Custom made, high quality silicone hoses with 4 layers of polyester reinforcement and wrapped in steel wire. These hoses can handle very high temperature and vacuum pressures.